The Continual Improvement Process (CIP) is an ongoing effort to improve products, services, or processes. 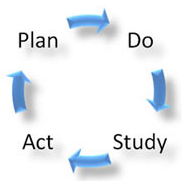 It’s is a six step systematic approach to plan, sequence and implement improvement efforts using data and elaborates on the Shewhart Cycle (Act, Plan, Do, Study). The CIP provides a common language and methodology which enables understanding the improvement process. The CIP always links back to each organization own goals and priorities.